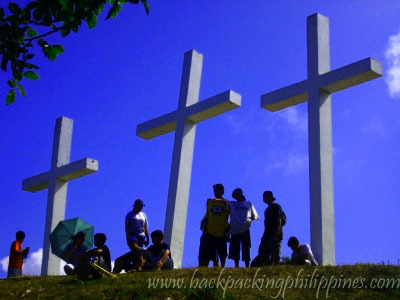 Becoming quite popular these last few years due to development and the improvement of both the trail and service road leading to the park, Tatlong Krus of Paete are three crosses on Bundok ng Humarap, similar to the biblical Calvary Hill's Three Crosses. It's history is tied with the neighboring town of Pakil, once part of Paete, and where stands a cross on Mt. Ping-as. 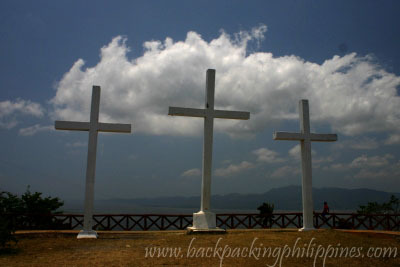 When Pakil decided to secede from Paete, the Paete towns folk decided to erect not one, but three crosses, on top of the hill fronting Paete and facing Laguna de Bay. Tutubi intends to trek up again to Paete's "calvary hill" this coming Holy Week, where the place is mostly packed with visitors and picnicers and campers (who pitch tents for free accommodations). Lots of tourists spend the night there on Holy Thursday, Good Friday till Black Saturday. There's public toilets and water supply and it's safe too. About fifteen minutes downward trek is the Paete's Talon (waterfalls that some enterprising individuals try to name Matabunka Falls)...it's a small waterfalls that is now trickling due to probably denuded watershed. Will try to find old pictures of this place or just re-take photos next time Tutubi takes a hike. 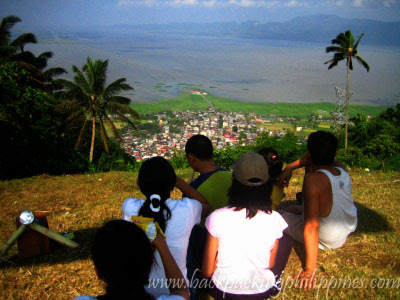 Trekking: start your walk on J.P. Rizal , paete's main road, corner Cads Street or Acyatan. St. just follow the concrete steps with bamboo hand rails, you won't get lost. No entrance fees nor charges going there. you can also hire guides from Paete Tourism Office. Trek time is less than hour (of course, it depends on your pace and stamina) going up, mush less going down, level of difficulty: light and easy. Driving Directions: you can actually drive to Tatlong Cruz via the road in Longos, Kalayaan near Exotikk Restaurant (landmark: Petron gas station). Just follow the road then turn left when you see the sign "road to talong krus) opposite Adelina's Peak. Should you find yourself in San Antonio, just go back. Travel time is about an hour. I want to experience treking !! that would be a busy spot this coming holy week i'm sure. are you from paete? i just read the post on getting a passport and saw the reference on travel time from paete to the lucena regional office. just curious -- my mother hailed from paete (calabig-navarro family, and of course, fadul etc). i just read this too on tatlong kurus. my family and i tried to trek it last good friday but we went back at halfway point, it was 5pm and hubby didnt want to go down at night, with our young kids. anyway thanks for the tips. will visit ur site from time to time. Wow, "Tatlong Krus" can now be found using Waze!